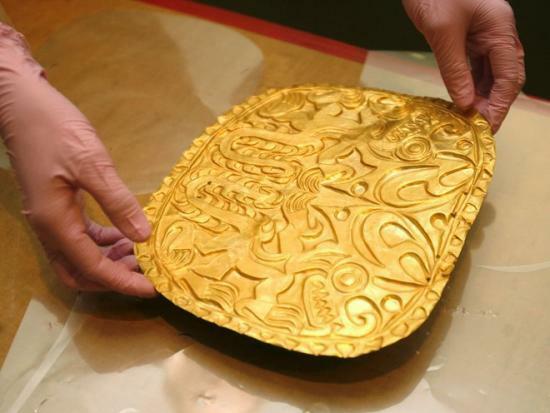 Entering the Gilcrease Museum galleries that house "To Capture the Sun: Gold of Ancient Panama" is to walk into the middle of a mystery. The exhibit is made up of more than 200 objects from the Gilcrease collection, augmented by large format photographs of the regions in Panama from where they originally came and life-sized mannequins adorned with reproductions of some gold items on display. It is the first time such an extensive amount of these items have been put on public display since museum founder Thomas Gilcrease acquired the collection in the 1940s. What makes this show have a bit of mystery to it, said Gilcrease director of exhibitions and publications Randy Ramer, is the fact that - in some ways - the ancient cultures of Panama are among the least studied and least understood of pre-Columbian civilizations. "We started working on this exhibit about two years ago," Ramer said. "And we sought out scholars from Panama, England and the United States, to get as many different perspectives as we could about how these objects might have been used and what meanings they may have had for the people who used them." The objects are from a region in Panama called the Gran Cocle and span a period of time from about A.D. 700 to the late 1500s, when Spain began its conquest of Central and South America. Some of the cultures in these regions built cities and monuments that have survived millennia. However, Ramer said, the people of the Gran Cocle region of Panama left behind no such creations. "It's not that their civilizations were any less complex than, say, the Mayans or the Inca," Ramer said. "It just means they built structures using less permanent materials." 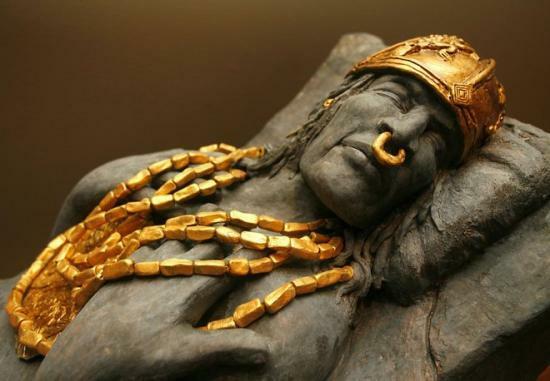 What has remained are remains - ancient burial sites uncovered through archaeology and through accident, as when a major Panamanian river shifted its course, revealing a treasure trove of gold objects. 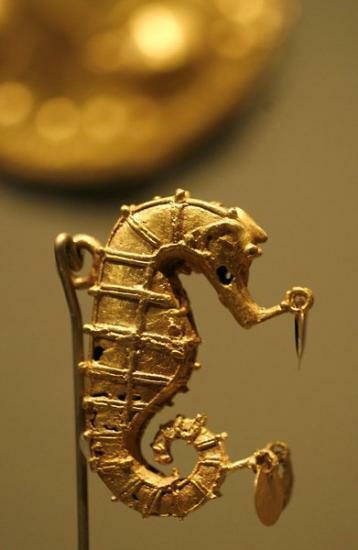 Archaeology in the Gran Cocle region is ongoing, and discoveries continue to add to scholars' knowledge of these ancient people - the sophistication of their metallurgical and goldsmithing skills and the unique importance of gold objects in their lives. "Objects that had some sort of brilliance to them were very important," Ramer said. "They believed that, because of the way these materials reacted to sunlight, the wearing of gold was a way of wielding some kind of cosmic power because gold did not tarnish, and it captured light in a certain way that no other material did." In addition to the gold objects, the exhibit also includes a wide array of polychromatic ceramic works, from ceremonial bowls to a collection of whistles crafted in the shape of very distinct, very different species of birds. Ramer said Gilcrease will display the whistles with photographs of the actual birds, to show how exact the maker was in capturing the form and coloring of each species. The exhibit also includes a number of unique displays - several life-sized mannequins created by Gilcrease preparator Jeff Brierly that show how some of the objects on display might have been worn. 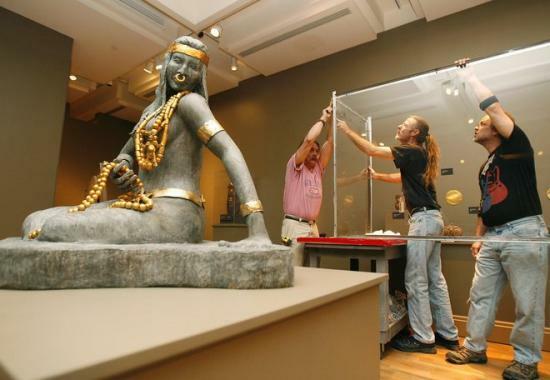 "The objects themselves are reproductions," Ramer said. Another preparator, Patrick Geary, created displays that resemble the volcanic rocks that dot the landscape around the Gran Cocle region. "It's a way of showing how these objects were literally part of the landscape," Ramer said. "And it gets to one of the points of this exhibition - to provide a real opportunity to convey how people view things in different ways. These objects were not simply decorations or currency but a very important part of this people's life and culture and understanding of the world around them."